OH HI. So this morning I had a major site crash, and it lost my whole post. So – here are three photos, and the recipe. Lawd knows I have no idea what I blabbed about this morning. Something about Emily Gilmore and having a face that looks like a lighthouse? Because I make sense like that. Heat 1 Tbs. of butter and the oil in a large skillet over medium-high heat. Once the butter foams, add the lemon slices and sear on both sides, 2-3 minutes total. Reserve lemons. Back in the skillet, add the remaining butter. Once foaming, add the garlic, and sauté for 30 seconds, until fragrant. Add the beans and toss in the garlic and butter. Season the salmon on both sides with salt and pepper, and nestle them in the skillet. 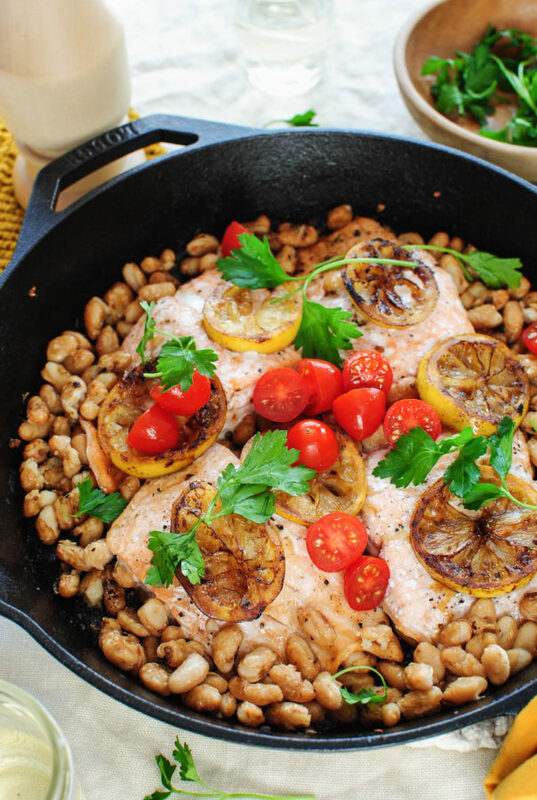 Arrange the lemon slices on top of the salmon, and bake for 15-20 minutes, until the salmon is cooked through and flakey. Garnish with halved cherry tomatoes and torn parsley sprigs. 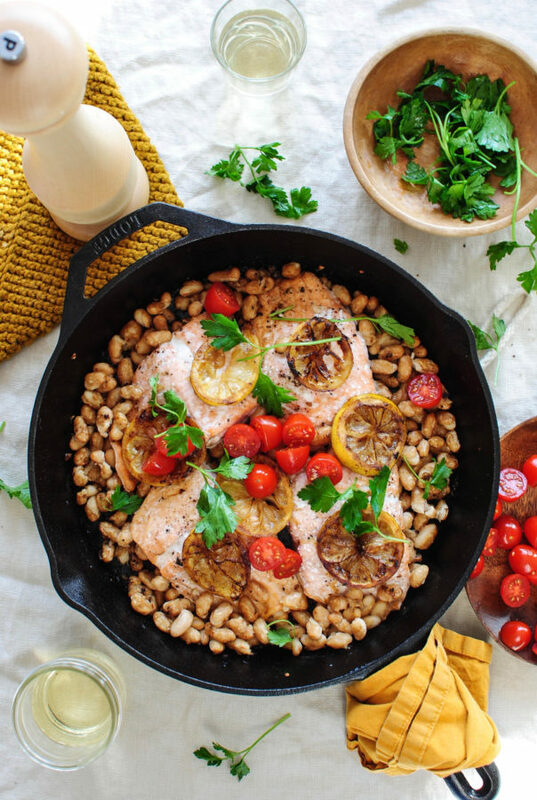 Give the whole skillet another squeeze of lemon! DONE. INHALE. Bev - you brilliant badass, you've done it again! Can't wait to try this with some of the super yummy salmon from Costco . . . just one teeny question, when you say "nestle" the filets in the skillet - is that on TOP of the beans in the skillet? Or on the skillet cooking surface, surrounded by the beans? A little clarification for my middle-aged muddled mind would be helpful - thanks! Glad you asked! 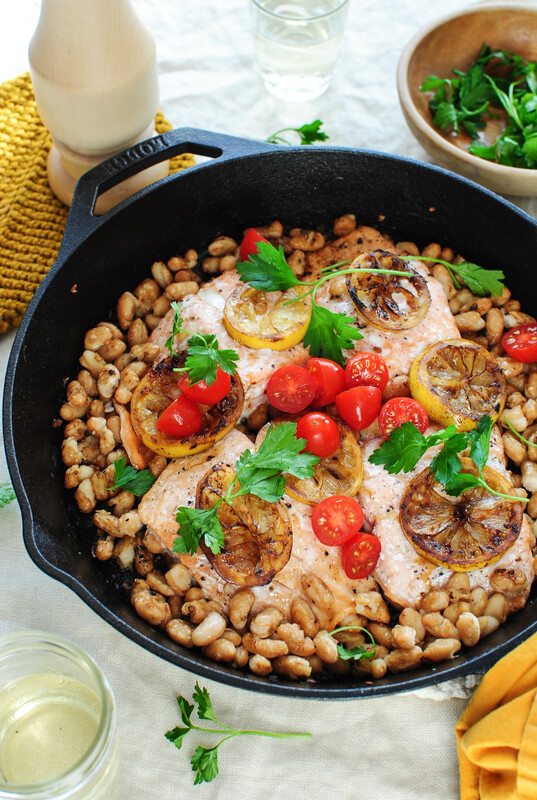 You can scoot the beans to the sides and nestle the salmon down in the pan. Where the fillets touch the pan! Not really on top of the beans. Hope this helps! Made this for dinner and it was delicious. omg the beans. soooo good. Thank you so much for telling me! Makes my DAY. Happy you enjoyed it!